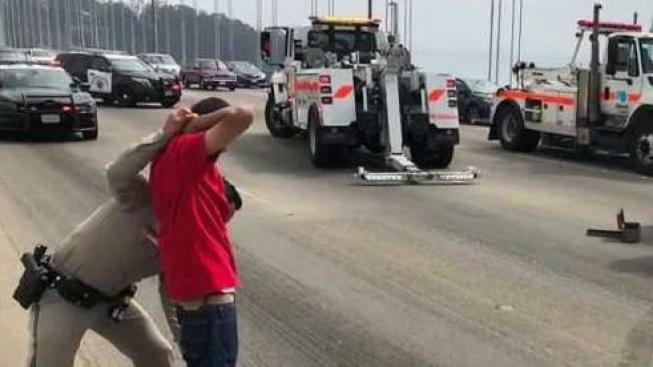 Multiple drivers brought traffic on the Bay Bridge to a halt Sunday morning as they did donuts on the top deck of the bridge near Treasure Island, according to the California Highway Patrol. One of the drivers involved in the sideshow was taken into custody, according to the CHP. A number of other vehicles believed to be involved were stopped and cited for mechanical violations when they exited the bridge. The driver who was arrested is being booked for reckless driving and exhibition of speed, according to the CHP. His car will be impounded for 30 days. One of the other drivers who was stopped also had their vehicle impounded because they did not have a license, according to the CHP. The sideshow along the Bay Bridge occurred around 10:45 a.m., according to the CHP. Before it began, the CHP received reports of multiple vehicles participating in another sideshow in the Oakland area. Those vehicles were later said to be headed toward the bridge.